Long before Ernest Hemingway wrote, drank and fought his way into the ranks of America’s legendary wordsmiths, the beloved author cut his literary teeth on the beat of a Canadian newspaper. Fresh off a stint driving an ambulance for the Red Cross on the Italian front during World War I, the young Hemingway landed at The Toronto Star Weekly in early 1920, where he covered everything from mobsters to the complete uselessness of wedding gifts — including the rise of stolen valor and the lousy market for war medals that accompanied the end of the Great War. 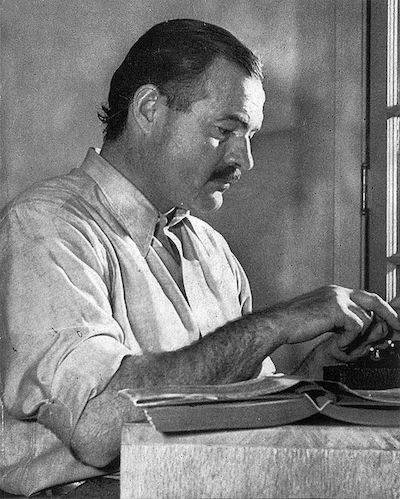 Hemingway posing for a dust jacket photo by Lloyd Arnold for the first edition of "For Whom the Bell Tolls", at the Sun Valley Lodge, Idaho, late 1939.